If you are working in digital marketing, especially in digital advertising, you are probably on the same mission – always chasing that elusive ROI and looking for ways to lower costs and improve the gains. It can be hard at times and there is always room for improvement. And you have probably already tried dozens of tools to see if they can help you in your ongoing mission. I have never used a media monitoring tool (except basic google alerts) before starting to work for Mediatoolkit. Although the primary function of media monitoring tool isn’t campaign optimization, you would be surprised in how many creative ways they can be used to boost your performance. 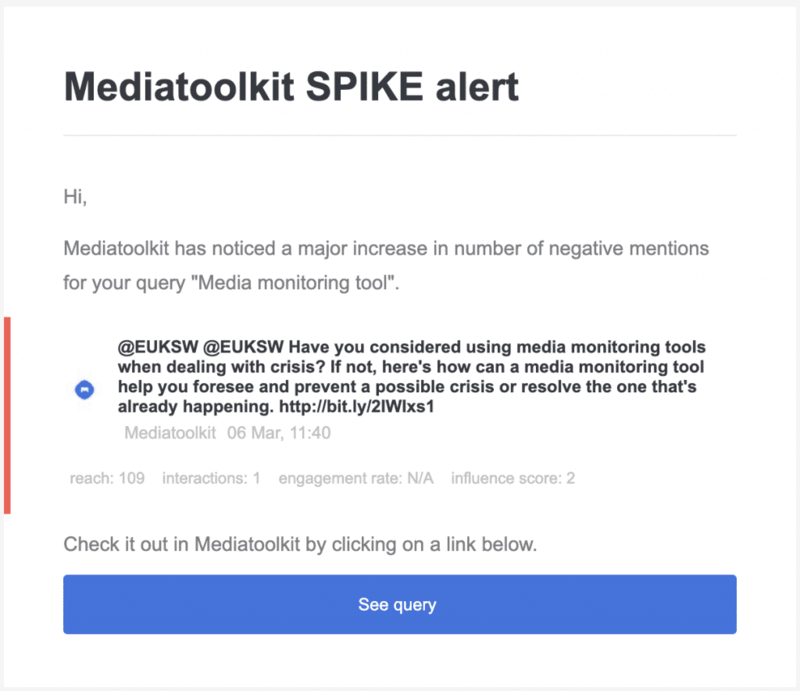 Keep in mind that I will be focusing on Mediatoolkit since that is the media monitoring tool that I use, but there are many other tools like Mention or Cision that can be used in similar fashion. And now we will talk about the top 10 ways of using Media monitoring and analytics tools to improve our advertising efforts. This one is great for when just starting out. If you are launching a new product or if you are a Marketing Agency, you will love this one. We can use media monitoring for market research and gain valuable insights on where to even start. Also, we can get information on what channels our audience is mostly using and how much interest is there in products similar to ours. It’s also great for generating keyword ideas but we will get to that in a second. Let’s keep to the basics here and show what would be a good way to start. Let’s say we are launching a new line of shoes that we plan to sell globally through our Web store. 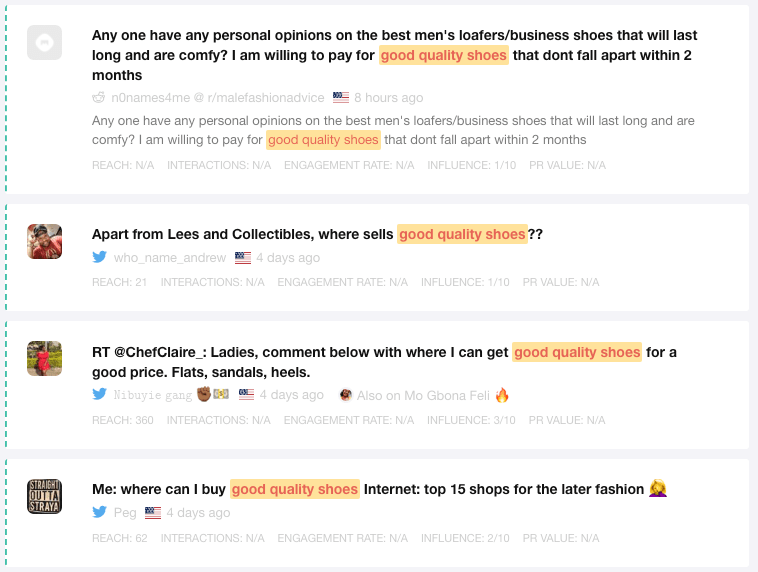 We can track queries like “where to buy shoes”, “good quality shoes“, “recommend good shoes” and analyze the results from across the internet. The first question you would probably ask yourself is where to start? You could ask on which countries to focus first since the whole world can be a big place. Start researching the niche before making the campaign (get keywords, understand the target audience and their needs to create a value proposition, etc.). 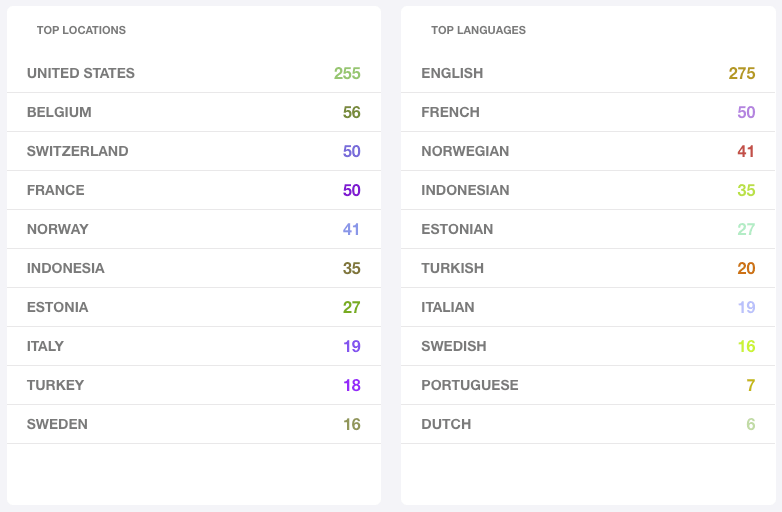 From the screenshot above, we can see that most mentions of our selected keywords were on English and from people in the United States. That can give us a good indication of where to start our advertising efforts and for what language to localize our site. Another, I would say more important insight is through the feed itself. By doing some qualitative analysis of people’s concerns, needs, and desires, we can tailor a perfect message and value proposition to skyrocket our campaign. As we can see from our example above, many people are concerned about the quality of shoes and their lasting power. We can use those insights to our advantage and tailor our messages to our user needs – provide what they really want and not just what we think they want. Another great way we can prepare for our marketing efforts is to analyze the competition and what they are doing. That is particularly useful when trying to penetrate the new market and we want to see what our competition is doing. Analyzing what our competition is doing great, and iterating on that with our own unique flavor can help us to grab the hearts of our potential customers and get a strong start. Also, analyzing the weaknesses of our competition can help us find the gaps that we can fill and provide the solutions that our customers are looking for. Let’s stick to the above example of a new shoe brand. We will add our competitors to tracking and analyze their marketing efforts. On the graph above, we can see the number of mentions by our 3 selected competitors. As we can see, all of them are most active on Instagram and Twitter. With that, we can already predict that those channels are where our audience probably spends most of their time. Here we can save a lot of money on market research and use the information from other companies in our niche. But what is more interesting, is to compare the below pie chart to our graph above. 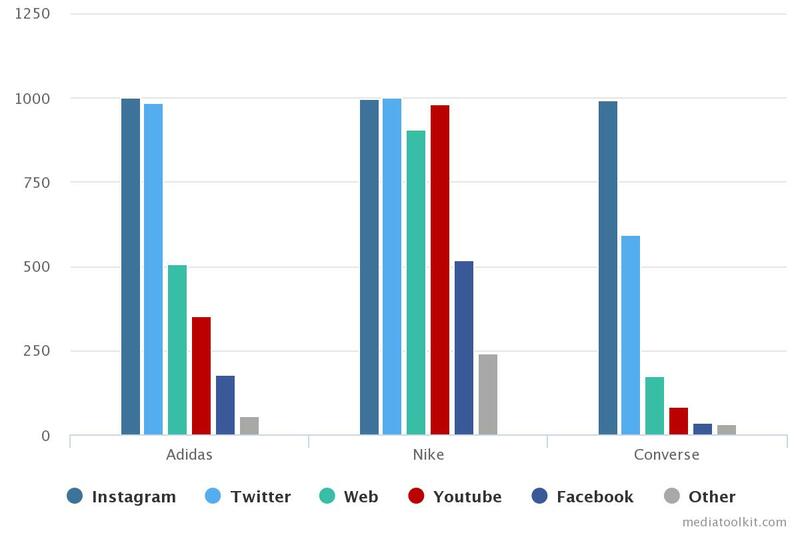 As we can see, Converse has the least amount of mentions on what usually correlates with the least amount of budget spent. 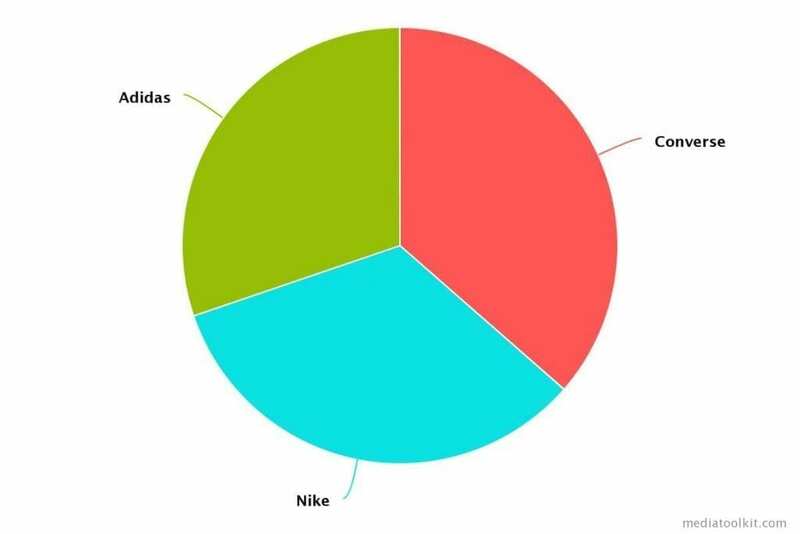 But as seen from the pie chart below, they have the biggest impression share from all compared brands! That means they are doing something awesome. We can dig more into qualitative analysis of Converse mentions to see what brings them so much success and use that to our advantage. We all want to be at the right time, in the right place with the right message with our advertising, right? Here is another neat idea on how to utilize media monitoring to achieve that. Advertisers know very well that generic messaging and advertising to “everyone” can’t compare to the results we can get when targeting the specific needs of our audience. So here is the keyword cloud that can help us a lot in seeing what people are actually interested in. In our example, shoes would be a generic term, but how to know what kind of shoes do people actually want? 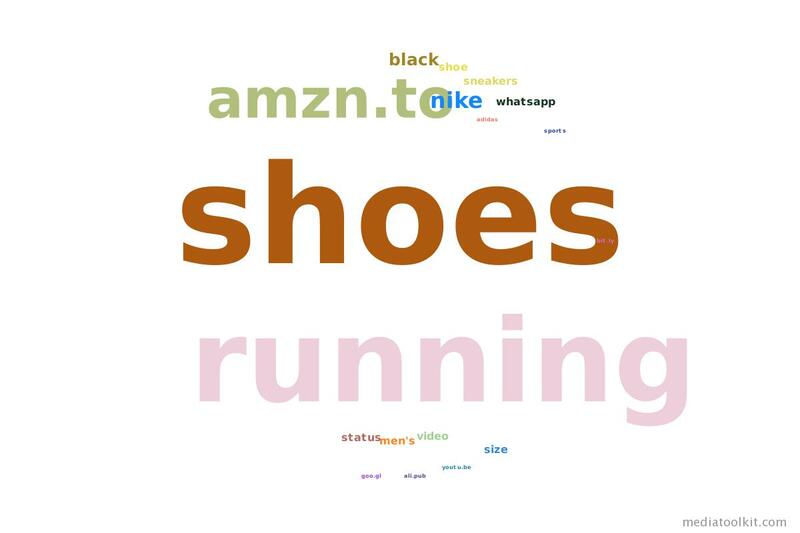 Looking at the keyword cloud, we see that the word “running” is mentioned a lot with the word shoes. 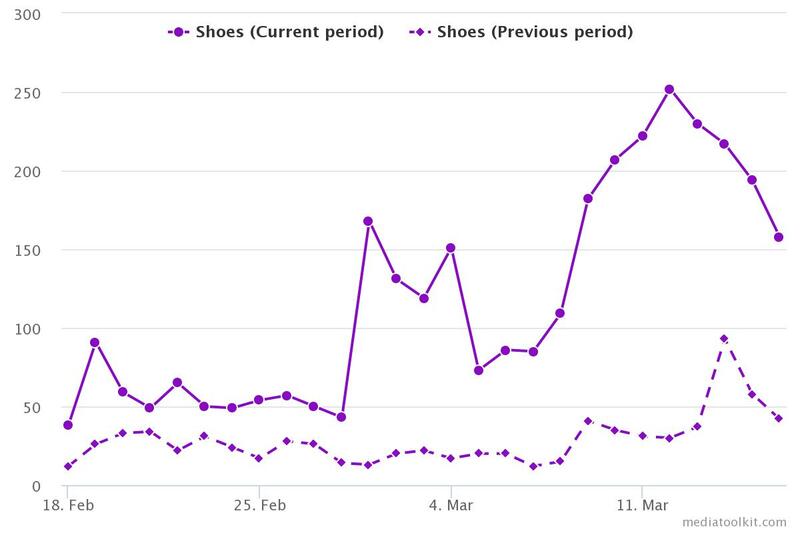 So if we are doing paid search campaigns, we can utilize this information to craft our campaigns and creatives around running shoes since that seems a lot more popular than any other type of shoes. Also, “black shoes”, “men’s shoes”, “shoe size” are also popular combinations that we can exploit when creating our campaigns. For every keyword, we can go even deeper into the qualitative analysis. By clicking on the keyword, we can see the original posts to get deeper insights into the context of mentions that could help us in creating our ad text. Continuing with “the right place at the right time”, there is a neat trick we can utilize to get a piece of a pie on someone else’s effort. Let’s say our competitor goes with some big campaign, and interest in the product surges across the internet. We can utilize that data and adjust our campaigns accordingly. By looking at mentions over time graph, we can see the trending of our product over time. It functions similar to google trends, the tool you probably already used before. But the main difference is that by using media monitoring tool you get aggregate data from all tracked sources, not just google search that Google trends provide. What about Twitter, Facebook, YouTube, Instagram, Forums, Webs… There are a ton of other channels that contain information we are not able to get by just using google trends tool. So when we see there is a spike in interest, we can boost our campaign budgets to reach more audience (for usually a lower price since there is a bigger audience) and another way around: when the interest is lower (especially for seasonal products) we can decide to allocate our budget on smarter things than accidental clicks and impressions. So let others create the need and interest, and you be there to offer the solution with your unique value proposition. Another great feature that even many advanced users of social media monitoring tools don’t utilize is helping with link building efforts. If we already know who is mentioning our brand name or our product, why not go a step further and get the link back to our website? You would be surprised how many times brands are mentioned on different blogs and websites that don’t contain the link back to the source. And if we can find those mentions, all we need to do is contact the publisher of that article and ask them to link back to us. Since they already talked about us, there is a bigger chance they will do it than when we use cold outreach. And let’s just say your boss will be much happier if he knows you didn’t have to pay to get a new backlink. Every content writer knows that getting ideas for new blog posts that are interesting and relevant can be hard at times. Using a media monitoring tool, we can find new inspirational sources while in one of those “mental blockade” states. We can see what is trending, related to our brand and/or product, see the quality and quantity of our audience reactions (sentiment and reach) and use that information to get fresh ideas and create content people are really interested in. This is one of the most useful features of media monitoring tools that many advertisers use to generate leads and sales. It can save a lot of money that we would have to invest in other means of generating conversions. And it is also very effective since it is personalized and responds directly to the need of our lead. With media monitoring, whenever someone searches for the product you are offering, you’ll have an opportunity to recommend your store or service. Since media monitoring functions in real time, you have a chance to be first to respond which also increases the chance of a conversion. There are thousands of conversations happening every second for the topic of our interest and can easily go unnoticed. But when we start monitoring mentions and keywords of interest, we can start conversing with potential customers – and that might get us a lot better results than just serving generic ads in front of our potential customers. There will also be times when people search for competitor products, and we know our product can solve their problem. We can also use media monitoring to find the people who are looking for rival products and talk to them about what we offer. You may be surprised how effective this tactic can be. This isn’t something new on the market. It is one of the main tactic used on Quora by marketers because it works so great. But why just Quora? There are a lot more conversations on social media, forums, blog comments that we miss everyday and that is where media monitoring can be very useful. As the report released by Monetate and Econsultancy showed, many marketers see real-time marketing as an important way to improve customer engagement and conversions, but only around 8% of marketers use it. It is not hard to see why that is so, because rarely we catch the viral information on time to be able to react to it with our brand message. Those who manage to do it see the conversion rates up by 75% from utilizing real-time marketing strategies. We all remember Oreo and the brilliant dunk in the dark campaign they made. With media monitoring tool you don’t need to check social networks/forums/websites every 5 minutes to see if there is some potentially viral situation happening around your product or industry. All you need to do is track relevant keywords and if something happens you will get instant notification on your mail that gives you enough time to react with a real-time marketing campaign. Influencer Marketing is still on the rise and according to Influencer marketing Benchmark Report made by Influencer Marketing Hub, the total market size in 2019 is projected at $6.5 billion. Also, 80% of marketers find influencer marketing to be effective in achieving the marketing goal. But still, there is a big problem in finding the right influencer, especially when there are enormous amount of fake influencers out there. In fact, fake influencers and influencer fraud was a big concern for 64% of brand marketers in 2018. So how can we utilize media monitoring tool to help us find the right influencer for our marketing campaign? It’s actually pretty simple. As usual, we can track our brand name, generic product or any other brand-product combination that we are interested in. W can then look at the reports to see who is already most influential for that topic. 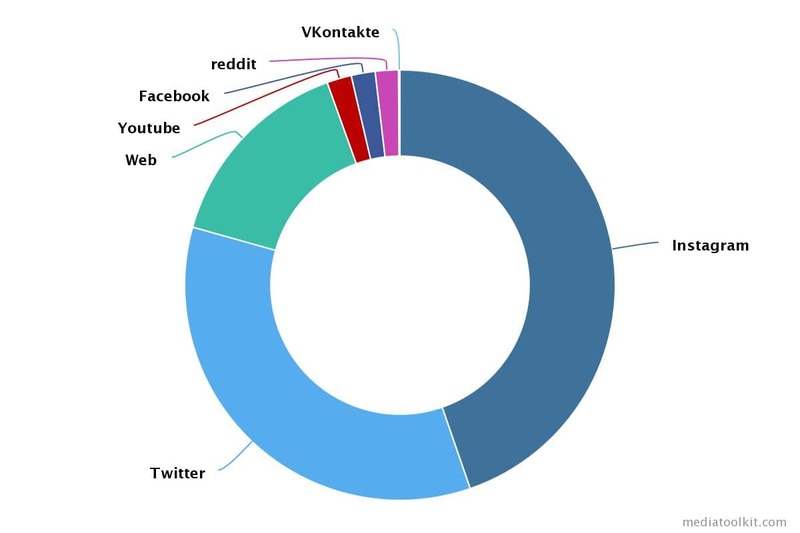 As we can see, there is a good number of ways we can approach the selection of influencers – if most of our traffic comes from YouTube, we can see who has most influence on that channel for our topic, we can see who is most engaged in the topic and has the most impact on its followers, who can reach the highest number of people etc. The great thing is, if we monitor our brand name, we can see who are our biggest influencers already and focus on building deeper relationships for a long term collaboration. This one is great when just starting with a new product but it can also serve as a trend monitoring throughout the time. We want to market to the right audience and we can’t do that if we don’t know where our audience actually is. Media monitoring can help us here, since we can track general mentions of the product category we are interested in, competition, our own brand or any other topic that can give us valuable insights. Just by monitoring, we can get the report on which channel is the topic most mentioned and focus our marketing efforts toward that channel. As we can see from our shoe example, “good shoes” and “where to get good shoes” has most mentions on Instagram. This way we know that people are “talking” the most about our topic of interest on Instagram, so it would be logical to focus our marketing efforts to that channel. So that would be some of the 10 actionable ways to use media monitoring and analytics tools in your advertising efforts. We can use media monitoring tools as a great starting point when just planning our marketing strategy, as a mean of finding and exploiting opportunities and as a supportive tool, for proactively preventing crisis situations. If we continued, we could probably come to 100 ways but we will leave you some exploring and finding creative ways on how to use media monitoring and social listening to improve your ROI. So we definitely recommend you try one such tool if you still didn’t. And if you’re interested in Mediatoolkit, you can start using it here, 14 days free. Performance Advertising Specialist at Mediatoolkit spending most of his time managing paid campaigns and optimizing performance.